Whether income is limited by low wages, no work, the fixed income of seniors or disability, the energy poor are defined as those for whom more than ten percent of their income is needed to cover energy costs. Since those folks many times also are housing poor (more than thirty percent of their income goes to basic housing costs), the effects grind hard on their ability to make it from paycheck to paycheck. Some live on a constant edge, a couple of missed paychecks away from sleeping under a bridge alone or with their families. During this current brutal winter in the northern United States, such a load means cold houses with thermostats set well below comfort and pipes at regular risk. Life lived wrapped in a blanket. If Al Gore or Bill Gates (or Donald Trump for that matter) doubles his electric bill, it’s not even a petty inconvenience. More than likely since someone else probably does the mundane work of paying their bills, they wouldn’t even be aware of it. For someone energy poor, such a disaster could be the difference between fresh vegetables and cheap boxed mac and cheese, straight or crooked teeth for Johnny or a ten-year-old car that takes you to work and one that is busted or needs gas and is parked on the street outside the apartment house where the rent already strains the budget. Thirty million Americans live in energy poor households. Among the population in the world’s “rich countries,” two hundred million are so burdened. In Europe where renewable subsidies (and costs from emissions caps and targets) exceed the United States, thirty percent of Germans are energy poor; in Greece the toll approaches fifty percent. In the United Kingdom, since 2006 while trying to hit coercive renewable targets, energy costs have risen 36% in real terms, while income has grown 4%. A poll in 2014 found one third of British elderly leave at least part of their house cold; two thirds bundle up with extra clothes in their homes. 15,000 died in the tough winter of 2014-2015 because they couldn’t afford to heat their homes properly. 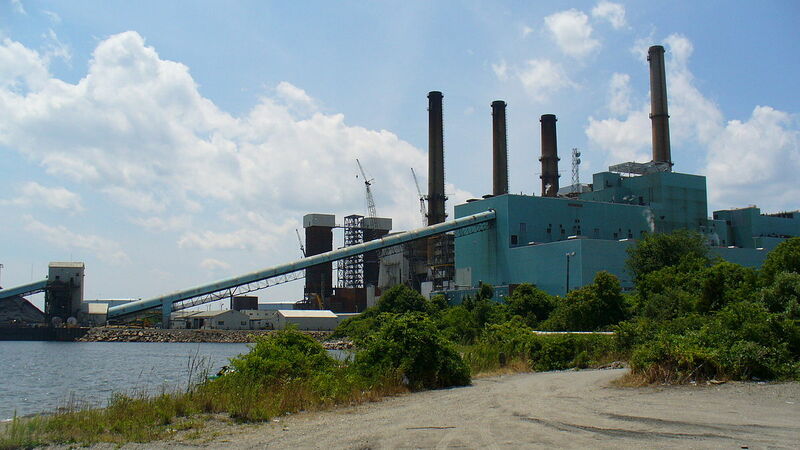 Brayton Point coal fired 1,500 megawatt plant in Fall River. Closed in 2017. There is good news[ii] regarding carbon emissions with a milestone in 2016: natural gas passed coal as a source of electrical generation for the first time. Admittedly, a short-term solution, because while gas emits about half the carbon as coal per megawatt generated, the fracking techniques and drilling that freed new sources of plentiful natural gas also emitted significant amounts of methane, an even more efficient greenhouse effect gas than carbon dioxide. Coal use has steadily declined for the last three years after peaking ten years ago. Nuclear power generation and renewables with hydro-electric leading the pack, have grown as a percentage of power production, but they are more expensive, especially solar and wind. We’ve already noted who gets hurt with that. Who benefits? Those of means and higher income can take advantage of disproportionate government support for expensive electric cars and solar panels on their roofs. The poor and working poor will not be getting energy star tax credits; they’ll be struggling to keep the heat and lights turned on. A modest, and to me, humane suggestion: avoid the “Inconvenient Untruth” histrionics and cease the ham handed, ideologically and politically motivated, big government (or worse international) draconian intervention on carbon emissions or swaps. Instead focus efforts on research and development of affordable and sustainable energy solutions that do not punish those least able to pay the bills. I’ve worked in an industry with lots of working lower middle class persons for all my career and understand their worries and cares. To someone making $15 or $18 an hour with a family, doubling their electric bill or oil bill would seriously concern them and cause them sleepless nights. I worry that the elite ruling class pays them no heed with their ivory tower global environmental “solutions.” Sounds great until someone’s kid gets sick because it’s too cold in the house or they can’t afford the co pay at the emergency room. They work all day in the cold (climbing trees, running forklifts in a lumberyard, delivering material to job sites, framing houses in January – all of the above I’ve done), then go home to a place where the thermostats are set at sixty two or lower. These are decent, hard working people with dreams for their kids who deserve more consideration. They are part of the dissatisfied and voiceless who elect guys like Trump. No simple solutions. Bet they won’t make that mistake again! Very complicated stuff, Steve. Just because Trump is a narcissist and dangerous populist doesn’t mean: A.) That he’s always wrong, and B.) That he doesn’t have a strong core following of those who feel disenfranchised and helpless before the vagaries of whatever a capricious and deeply polarized government decides to do to them. And tyrants in our lifetime have come more frequently from the left. As I said, no simple solutions..